A not-too-sweet treat the whole family will love! I’ve always been a fan of carrot cake although for many years I deluded myself into believing that it’s actually healthy because it has vegetables in it. Of course, I was wilfully ignoring the fact that most carrot cake recipes are loaded with sugar and fat. As a conscientious new mom, I even served carrot cake at my son’s first birthday. By the time his younger sister turned one, I had realized cake is cake….and she got chocolate. 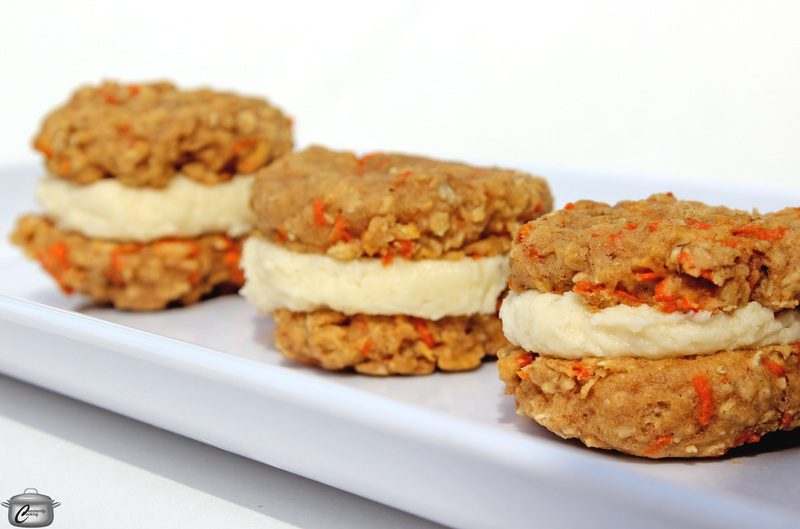 Nevertheless, despite this previous naiveté, I am always keen to find desserts that are just a teensy bit healthier, and these carrot-filled treats do the trick for me. The cookies themselves are low in fat and very lightly sweetened so if you ate them on their own you could feel quite virtuous. 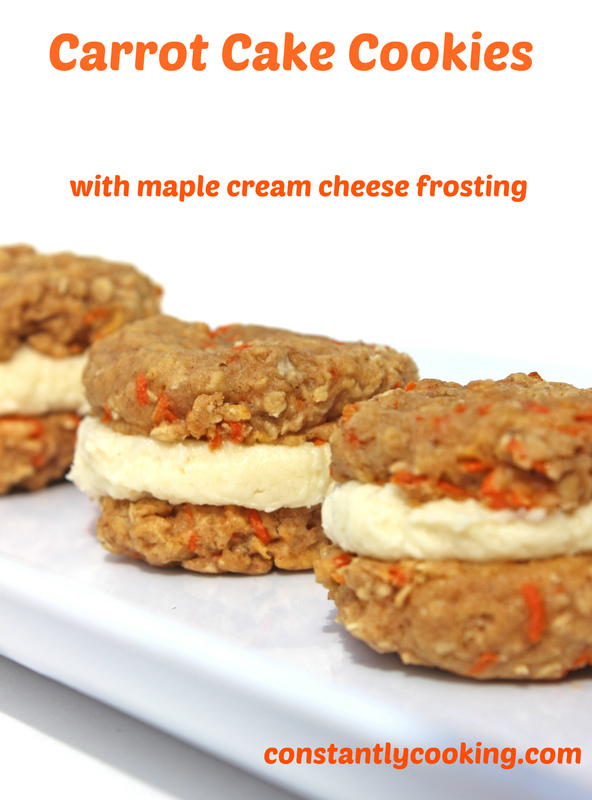 But…what’s a carrot cake cookie without a little cream cheese frosting, right? * if you forget to take an egg out of the fridge to warm up, just place it in a dish of lukewarm tap water and let it sit for 3 minutes before cracking and adding to the melted butter mixture. In a large bowl, whisk together the melted butter, vanilla, maple syrup and egg until well blended. Add the dry ingredients to the liquids along with the grated carrots and stir just until the dry ingredients are completely incorporated. Place a cover over the bowl and refrigerate the cookie dough for 1 hour, to allow the flour and oats to become fully hydrated. Chilling will also firm up the mixture, making it easier to scoop out onto the baking sheets. Preheat the oven to 325F. Line two baking sheets with parchment paper and set aside. Drop the cookie dough by small portions no bigger than 1 tablespoon (15 mL) each onto the prepared baking sheets. Flatten slightly using your fingertips or a spatula. Bake for 9 – 10 minutes until just beginning to turn golden brown at the edges. You want the cookies to still be soft in the middle, for a more cake-like texture. Cool on the baking sheet for at least 10 minutes before carefully transferring to a wire rack to cool completely. While the cookies are baking, make the frosting. With an electric mixer (or a whisk and some human power), beat the cream cheese and butter together for about 2 minutes, until well blended. Add 1 tablespoon of maple syrup and maple extract (if using) and beat again. Add the icing sugar, 1/4 cup (60 mL) at a time and keep beating until smooth. Add a bit more maple syrup if it seems too thick to spread between the cookies. To assemble, place a generous teaspoonful of frosting on the bottom side of one cookie (facing upwards) then place another cookie, bottom side facing downwards, on top. Gently press together so frosting fills the space between the cookies. Cookie sandwiches can be assembled then placed in an airtight container up to 24 hours. Remove from fridge for 30 minutes to allow to come to room temperature before serving. Refrigerate leftover cookies for up to 4 days. Makes 12 cookie sandwiches; recipe can be doubled. This entry was posted in baking, Dessert and tagged baking with maple syrup, carrot cake, carrot cake cookies, cookie, cookie sandwich, cream cheese, cream cheese frosting, dessert that's not too sweet, Easter dessert, gluten-free, gluten-free cookies, Paula Roy, sandwich cookies. Bookmark the permalink.